Links to external websites are provided for your convenience and information only. 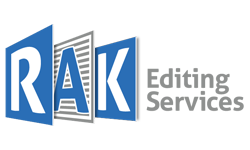 RAK Editing Services accepts no responsibility for the content, accuracy or legality of material on third-party sites or subsequent links. RAK Editing Services does not endorse or recommend the products, services or opinions you may find on external sites. If you have questions about the content of an external site, please contact the administrator of the external site.